The iconic Gothic horror classics that gave birth to the monstrous myths that still inhabit our nightmares. 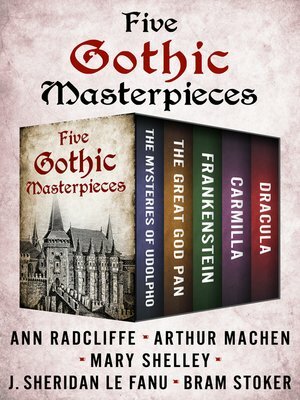 Tragic heroines, windswept moors, dark and stormy nights, castle prisons, and forbidden desires realized at the greatest cost—these are the elements of Gothic horror, given its finest expression in these five enduring novels. Frankenstein: Obsessed with the secret of creation, Swiss scientist Dr. Victor Frankenstein cobbles together a body he is determined to bring to life. When the creature opens his eyes one fateful night, the doctor is repulsed: His vision of perfection is a hideous monster. Dr. Frankenstein abandons his creation, but the furious, lonely monster will not be ignored, setting in motion a chain of violence and terror. A gripping story about the ethics of creation and the consequences of trauma, Frankenstein is as relevant today as it is haunting. Dracula: Upon a visit to Transylvania, young English lawyer Jonathan Harker makes a horrifying discovery about Castle Dracula and its resident count, who survives on the blood of human beings. Thus a battle of wits ensues between the vicious count and his various adversaries in this legendary Gothic novel of horror, dark romance, and chilling suspense. Carmilla: Published twenty-five years before Stoker's Dracula, Carmilla is the passionate, thrilling tale of a mysterious young woman's dramatic arrival at an isolated castle. The innocent Laura has never seen anyone like the seductive, secretive Carmilla, except in her dreams—and an antique portrait, which resembles the visitor perfectly, down to the mole on her tempting neck. Laura quickly realizes there is something far more dark and sinister about Carmilla than meets the eye. The Great God Pan: When Mr. Clarke agrees to visit his friend Dr. Raymond, he is dubious about the proceedings he is to witness. In pursuit of what Raymond calls "transcendental medicine," the doctor intends to make a small incision in a woman's brain, allowing her to see past the world of the senses to a reality beyond imagining—a realm where, Raymond says, one can see the great god Pan. Stephen King has called The Great God Pan "one of the best horror stories ever written." The Mysteries of Udolpho: Orphaned heroine Emily St. Aubert has been imprisoned by Signor Montoni, her evil guardian, in his gloomy medieval fortress in the Apennines. Terror is the order of the day inside the walls of Udolpho, as Emily struggles against Montoni's rapacious schemes and the threat of her own psychological disintegration. A bestseller in its day and a potent influence on Walpole and Poe, this dreamlike, nearly hallucinatory classic remains one of the most important works in the history of European fiction.